Pepric moved to Kapeldreef 60, 3001 Leuven-Heverlee. Pepric Instrumentation & Services for pre-clinical studies of cell therapies and of magnetic particle therapies. Quantitative and longitudinal monitoring of the distribution and kinetics of particle and cell therapies. - pre-labeled cells, therapeutic cells, stem cells labeled with magnetic nanoparticles. The use of stable magnetic particles enables the longitudinal and quantitative biodistribution of cells, enabling the determination of cell pharmacokinetics, absorption rate, elimination rate, saturation dose and dose optimization. Cells can be labeled with commercial particles, and particles in development. The pEPR method allows an easy translation to the clinic: when cells are labeled with Rienso®/Feraheme®, this is an off-label use of the FDA approved pharmaceutical drug, and when pEPR is combined with 1.5T or 3T MRI. Example: quantitative biodistribution of pre-labeled cells in mice, accurate localization with in-vivo MRI followed by quantification with ex-vivo pEPR (peer reviewed article in preparation). 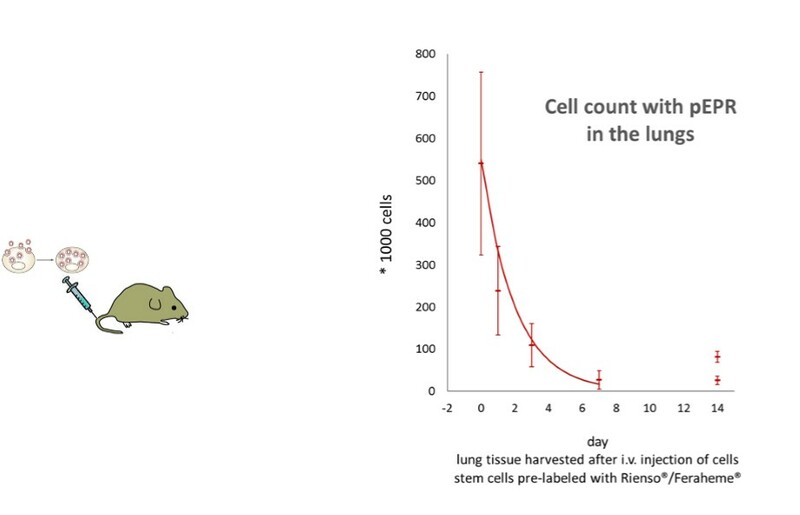 Example: cell elimination rate in the lungs for the pre-labeled cells in mice with ex-vivo pEPR (peer reviewed article in preparation). Magnetic nanoparticles can be quantified in tissue and blood samples with the pEPR method to study the distribution and migration of the particles in the animal body, and to determine the absorption and elimination rate of the particles in the different tissues, and to determine the saturation dose and optimal dose repetition time. Example: the blood-clearance time was determined of particles administered to rats. Blood analysis was performed with PPS at different time points after particle injection. Example: the correlation between particle dose and particle accumulation in the lungs was measured by quantification with pEPR of the particles in lung biopsies of pigs. 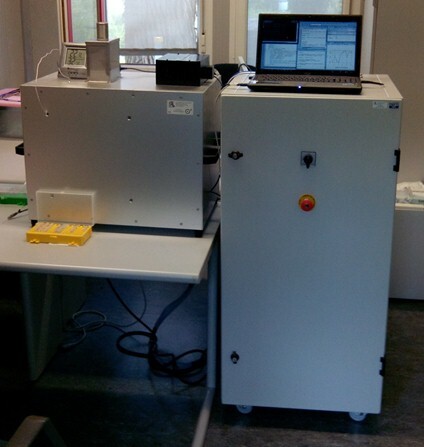 Although the PPS is designed for particle quantification, also pEPR spectra can be obtained with the instrument. The resonant signal of the particles is measured as a function of the applied magnetic field resulting in the broad iron EPR spectrum combined with the Langevin function. The pEPR spectra give valuable information on the more fundamental magnetic characteristics of the particles. The spectra can reveal for example the influence of the coating on the magnetic particle core. Also the magnetization can be investigated as function of particle dimensions, crystal structure, synthesis process and more. These studies give valuable information for the development of new theranostic magnetic nanoparticles as a target specific contrast for MRI, as drug carrier or particles for hyperthermia. Today, the implementation of the pEPR spectra as a standard measurement feature integrated in the firmware of the PPS tool can be requested by the user. - Pharmacokinetics, absorption and elimination rate, for example blood clearance time, cell and particle migration, saturation and clearance of target tissue, saturation dose, optimal dose repetition time, efficacy of particle coating for targeting. Complementing pre-clinical MRI with supporting quantitative data for molecular imaging and cell imaging. - cells labeled with Rienso®/Feraheme®, this is an off-label use of the FDA approved pharmaceutical drug. The ex-vivo PPS offers instant quantitative results in minutes time, no post-processing of spectra is required. - All organ tissues and raw blood samples can be analysed, also lung samples complementing MRI images. Avoid sampling errors and win time since no sample preparation or manipulation of blood or tissue is required. Pepric’s detection principle is based on pEPR, particle Electron Paramagnetic Resonance. pEPR yields sensitive and accurate results. The actual detection limit achieved to date is 10ng(Fe)/150µL for Rienso® as well as for for Resovist® in aqueous suspension, this comes down to 180 pmol(Fe)/150µL or 67µg(Fe)/L or 1.2µM(Fe). pEPR is a direct measurement of particle quantity. When a RF-field is applied, the pEPR signal amplitude is proportional to the particles in resonance. Use and applications of pEPR for cell quantification and magnetic particle quantification below! Pepric develops and commercializes instrumentation for quantitative cell imaging and molecular imaging. The tools find applications in the longitudinal and quantitative monitoring of the distribution and kinetics of cells and particles. In december 2014 Sygma.Novosibirsk announced a captial investment in Pepric. And previously in december 2011, Pepric successfully concluded a capital round financed by SOFI and Fidimec. These investments support the production and commercialization of the first product, the ex-vivo particle spectrometer. Pepric started in 2009 as spin-off company of imec, an institute performing world leading research in nano-electronics, headquartered in Leuven, Belgium. Perform test experiments on your samples. Instrument: Rental, lease, purchase of the pEPR instrument. 5. Follow the Celestijnenlaan, until the 2nd road on the right (after about 200 metres). This is the the Kapeldreef, you’ll find us in the I&I building at the end of the Kapeldreef, number 60. You can park your car in front or at the left side of the building. Leuven is a stop on the international railroad London (UK) – Brussels – Liège – Köln (Germany). Coming from any other line, you can change at Brussels’ North, Central or Midi stations, where there is a train to Leuven every 30 minutes. From Leuven station or downtown Leuven, bus 2 (Campus) will bring you to the Kapeldreef in Heverlee (terminus). The bus stop is situated just opposite the IMEC campus. You’ll find Pepric at the end of the Kapeldreef, 5-10 minutes walk from the bus stop. © 2017, Pepric All rights reserved.